The Lord was angry with Sodom and Gomorrah. He had heard of their sins and he was ready to deal with them accordingly. Yet Abraham stepped in and tried to save them. He asked the Lord to spare them if they could find fifty righteous people there, then forty-five, then forty, then thirty, then twenty, and finally ten. And the Lord said, “For the sake of ten I will not destroy it.” But not even ten righteous people were found and the cities were destroyed with fire and brimstone. Today Sodom and Gomorrah are synonymous with great sin and harsh judgement. While there are many disputes over the exact nature of their sins, the fact is that whatever their sins were, they consumed everyone who lived there. Both cities paid the price because not even ten righteous people could be found among them. Today it is easy for us to dismiss Sodom and Gomorrah, to see it just as a story of people gone wild, who turned so far from God that they were beyond redemption. It’s easy for us to hear the story of Sodom and Gomorrah as simply something that happened a long time ago in a place that was far, far away. We can look at what happened to them and think that was then but this is now. Thinking like that makes it easy for us to look at them with great relief that we are not like them; to think that their sins are so much greater and graver than ours. But are we really that different? Imagine if the story began like this… then the Lord said: “How great the outcry against the United States and how very grave their Sin! I must go down and see whether they have done altogether according to the outcry that has come to me; and if not I will know.” How grave is the sin of the United States that the Lord will find when he comes? Who are the righteous that might save our nation? I think that we can all agree that the sins of our nation are much greater and graver than ours. We aren’t like the rest of the country. Then the Lord said: “How great the outcry against North Carolina and how very grave their Sin! I must go down and see whether they have done altogether according to the outcry that has come to me; and if not I will know.” How grave is the sin of North Carolina that the Lord will find when he comes? Who are the righteous that might save our state? We can also agree that the sins of our state as a whole are greater and graver than our sins. We aren’t like the rest of our state. Then the Lord said: “How great the outcry against Winston-Salem and how very grave their Sin! I must go down and see whether they have done altogether according to the outcry that has come to me; and if not I will know.” How grave is the sin of Winston-Salem that the Lord will find when he comes? Who are the righteous that might save our city? This is hitting closer to home. But we can still look around and see that the sins of our city are greater and graver than our own sins. We aren’t really like those around us. Then the Lord said: “How great the outcry against Fries Memorial Moravian and how very grave their Sin! I must go down and see whether they have done altogether according to the outcry that has come to me; and if not I will know.” How grave is the sin of Fries Memorial Moravian that the Lord will find when he comes? Who are the righteous that might save our church? That might save us? This really brings it home, to a time not so long ago and to a place not so far away. We can’t really hear this and think that it doesn’t apply to us, any of this. We are Sodom and Gomorrah. We are the United States. We are North Carolina. We are Winston-Salem. We are Fries Memorial Moravian Church. We have our sins- our nation, our state, our city, even our church. It doesn’t matter if our sins don’t seem to be as grave as those of Sodom and Gomorrah. Sin is sin is sin is sin. We are all guilty of sinning. We are all sinners. As sinners, we all do things that move us further away from God. God doesn’t move away from us but we move away from God. We move away from God, we sin, every time we do something that hurts ourselves. We sin every time we do something that hurts others. We sin every time we fail to love God with our heart, soul, strength, mind. We sin every time we fail to love our neighbor as we love ourselves. We sin every time we fail to feed the hungry or give water to the thirsty. We sin every time we fail to welcome the stranger or clothe the naked. We sin every time we fail to care for the sick or visit the prisoner. We are sinners. The outcry against us is great. Our sins are grave. God sees them and God sees us. God knows them and God knows us. So where are the righteous who will save us? How many will it take? Fifty? Forty-five? Forty? Thirty? Twenty? Ten? Do we have enough righteousness among us to save us? No, we don’t have enough righteousness among us to save us. No, we don’t have enough righteousness to save ourselves, to save each other. It doesn’t matter how righteous we feel. It doesn’t matter how righteous we think we are. For we aren’t, and never will be, righteous enough. We don’t have, and never will have, enough righteousness among us. We can’t save ourselves. We can’t save our church. We can’t save our city. We can’t save our state or our country. We can’t save our world. There is only one who can save us. There is only one who is righteous enough. There is only one that we need. Yes, the outcry against us is great. Yes, our sins are grave. But it doesn’t matter. It just doesn’t matter. Because the record against us has been erased, set aside, nailed to the cross. We are forgiven by the death of Jesus. We are free from the burden of our sins. We are alive, together with him. Jesus has done his part. He has become the righteousness we need. He has saved us from our sins. Now it is up to us. It is up to us to continue the good work he began. It is up to us to bring about the kingdom of God. It is up to us to love as he loves. It is up to us to forgive us he forgives. It is up to us to serve as he serves. So let’s do it. There is no reason for us to judge, ourselves or each other. There is no reason for us to condemn, ourselves or each other. All of our sins are grave. All of our sins are forgiven. 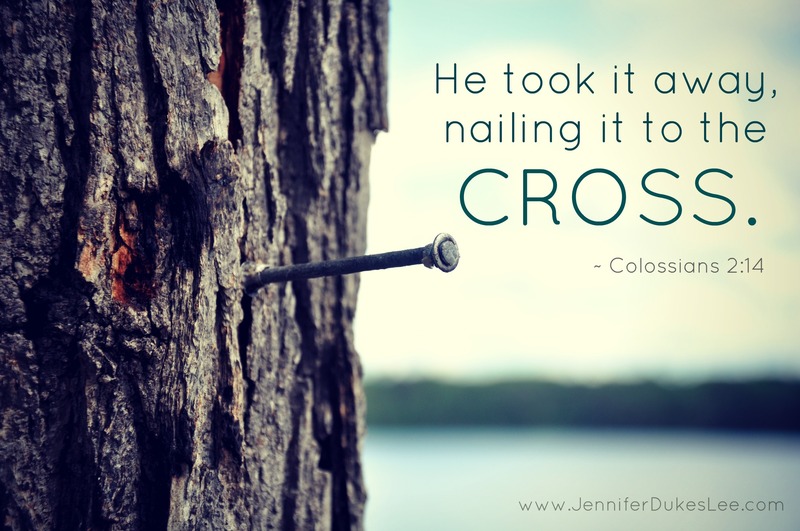 So let us put them behind us, leaving them where Jesus left them, nailed to the cross. With our sins forgotten us, let us go forward to love. With our sins forgiven, let us go forward to forgive. With our sins behind us, let us go forward to serve. How many righteous are there to be found among us? There is only one, but that one is enough.